I first became intrigued with Beckett's works during my college theatre days and can't wait to see The Hypocrites and Halena Kays put their unique spin on this classic. Endgame should be quite a departure from the trio of Gilbert and Sullivan musicals. Previews start tomorrow, Friday February 20th. Check them out at the fabulous Den Theatre Mainstage. The Hypocrites are pleased to continue their 2014-15 season with Samuel Beckett’s comic masterpiece ENDGAME, directed by Company Member Halena Kays*, playing February 20 – April 4, 2015 at their new home, The Den Theatre Mainstage, 1329-1333 N. Milwaukee Ave. in Chicago’s Wicker Park neighborhood. Tickets are currently available at www.the-hypocrites.com. 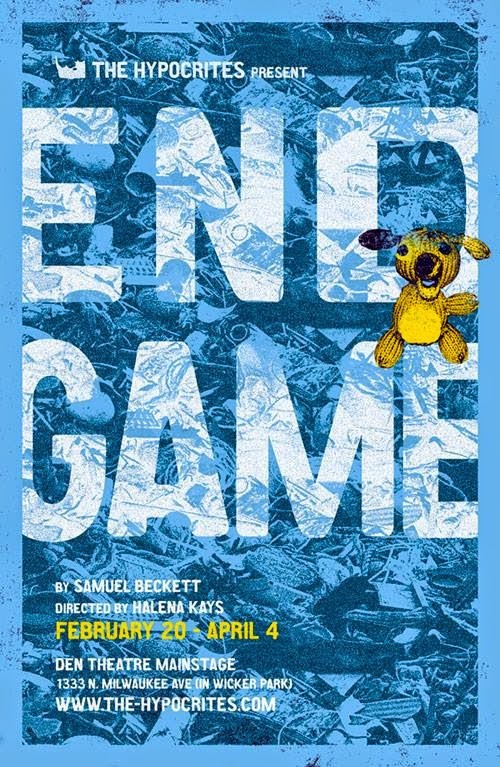 ENDGAME will feature longtime Company Members Kurt Ehrman* as Hamm and Donna McGough* as Nell, joined by Brian Shaw as Clov and Sean Sineski as Nag. Hamm is blind and cannot stand. His servant, Clov, cannot sit. And then there’s his legless parents Nagg and Nell who live in trashcans. Trapped in a tiny house by the sea after some sort of apocalyptic disaster, they trudge through an absurd, cyclical existence. In true Hypocrites fashion, the actors and audience alike share a full and lush visual world to experience Beckett’s classic comedy. “Endgame will allow me to play to the absurdity of life with the clowns I love,” comments Director Halena Kays. “Our design team is also full of long-time collaborators who will create an absurdest landscape that will involve and heighten the audience's experience with this classic. It’s one of my favorite texts – physical, funny and beautiful – and there's no better group of artists to join me in exploring it,” adds Kays. The production team includes: Elizabeth Bracken (scenic design), Jessica Kuehnau (costume design), Maggie Fullilove-Nugent (lighting design), Nick Keenan (sound design), Danielle Case (props design) and Justine B. Palmisano (stage manager). Tickets Prices: $28. Tickets are currently available at www.the-hypocrites.com. Halena Kays’ Chicago credits include: Ivywild, Six Characters in Search of an Author at The Hypocrites; The Magic Play at The Goodman, Lord of the Flies at Steppenwolf theatre company; Burning Bluebeard, 44 Plays for 44 Presidents, Daredevils, Daredevils Hamlet and Fake Lake at The Neo-Futurists (artistic associate); Roustabout at Concordia College; Buried in Bughouse Square at The University of Chicago. Kays is a former artistic Director of The Hypocrites, co-founder and former artistic director of Barrel of Monkeys, where she directed the majority of their public performances. She is The Hyprocrites’ Artistic Council, a founding member of the artistic collaborative The Ruffians, a UT-Austin and Northwestern grad, former member of the Big Apple Circus Clown Care unit and a visiting professor at North Central College. Halena has been nominated for a Jefferson Citation for Best Supporting Actress and Best Direction, was the recipient of the prestigious 3Arts Award and was named one of the top 50 “players” in Chicago theater by Newcity. Contemporary Art, DCASE Storefront and Chopin Theater before moving to a residency at The Den Theatre Mainstage. The company’s smash-hit production of Our Town, directed by David Cromer, transferred in 2009 to Off-Broadway, Los Angeles and Boston. The Pirates of Penzance has appeared at Actors Theatre of Louisville and American Repertory Theater (A.R.T.). A.R.T. has also brought Romeo Juliet, 12 Nights and The Mikado (forthcoming). The American Theatre Wing, best known as the creator of the Tony Awards, presented The Hypocrites with one of the 2013 National Theatre Company awards in 2013. In June 2015, the critically acclaimed All Our Tragic, a 12 hour play adapting the 32 surviving Greek tragedies, will return. For more information, please visit www.the-hypocrites.com. The Hypocrites’ 18th season is supported in part by The Alphawood Foundation, The Gaylord & Dorothy Donnelley Foundation, The Richard H. Driehaus Foundation, The Illinois Arts Council, Negaunee Foundation, Scholl Foundation and Venta. *Denotes The Hypocrites Company Members.